Nagano Prefecture is an inland prefecture located in the central Chubu region of the main Honshu island and home to most of the Alps with an impressive collection of mountains and beautiful natural environments. Nagano Prefectureis home to nine of the twelve highest mountains in Japan. 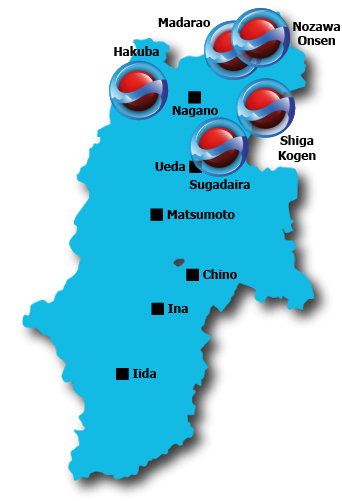 Nagano Prefecture was host to the 1998 Winter Olympics which helped to bring international attention to the region. Since then and in particular in recent years the number of people visiting Nagano from overseas has been rapidly increasing. There are over 80 ski and snowboard resorts in Nagano Prefecture, including many well-known major names such as Hakuba, Shiga Kogen, Nozawa Onsen and Madarao Kogen. Many smaller ski and snowboard resorts can be found on the mountains throughout Nagano, though most of the larger ones are found in the northern region of the prefecture.